TL;DR these are an idea for a two-part character. One half of the character is the adventurer and exists “beyond the wall” i.e. when they’re off adventuring. The other half exists “in the village”, or when they’re at home and interacting with friends and family. I still like the idea and it fits certain genres (anime comes to mind, where characters who are brave adventurers risking their lives still get into domestic capers when back at home). Later I wrote this into StormHack: see here (note that I re-wrote the A6 booklet here, but that later version doesn’t mention the Drama Game). But truth be told something’s always bugged me about this approach. The two sides are more or less entirely separate, which creates a kind of cognitive dissonance as players switch from one phase to the other. What I really wanted was for the PCs to have those relationships but for those to tie back into the adventure and for their emotional components to have an effect on (or at least be present in) the adventure game. StormHack characters do have a dual nature. The human is all about human experience, family, history and emotions, whereas the demon is about power, ambition, expertise and magic. The premise has always been that the human side has no levels, does not gain experience or power; but demons on the other hand have levels and it’s entirely up to the player how high those go. A higher level demon will give a lot of power but when it transgresses, it will really screw up the character’s life. This integrates the human side and the demon side. I’ll go into the mechanics of how this works some other time, but for the rest of this post I want to discuss the two sides to each character. The human side of the character is all about their past and ancestry, the life they had growing up, and the influence of friends and family. The standard 6 ability scores (STR, CON, DEX, INT, WIS, CHA) belong to this side of the character, and you can generate these any way you like — as a point-buy, rolling randomly, using playbooks as in Beyond the Wall, etc. The accompanying roots are influenced by Whitehack’s groups. They’re sort of broad statements about vocation and cultural experience, and you can leverage these in-game for an advantage on a d20 roll (i.e. roll twice and pick the result you like). The first and most recent is growing up. It’s all about the skills and experiences you got from your family and friends. If the family business was fishing, or milling, or brewing, that’s something you know how to do. It manifests in parents or other people of the same age who have been an influence as you grew up. The second root is tradition. This is something cultural about your family; it indicates belonging to an ethnic group, a race, or a tribe. The third and oldest root is legend. This is something like a rumour, family story, or connection to something very old that began long before you were born. Roots don’t have to be beneficial all the time. A tradition (which could be a religion, ethnicity, etc.) might be useful but at the same time bring the attention of bigots. A legend could be exciting and inspiring, or it could be a dark doom that follows the character around. Their apparent power that they exercise on behalf of their master has a real in-game effect: destroying things, enabling the character to fly or walk through walls, conjuring stuff out of thin air, seeing into the future, controlling other people’s minds. All of these effects go beyond what normal people can do. If the PC gives the demon permission to act, they risk the demon transgressing. That transgression also has a real in-game effect: destroying relationships, tainting reputations, attracting enemies. The act of transgression gives the demon power, and causes it to grow. This is a metamorphosis. 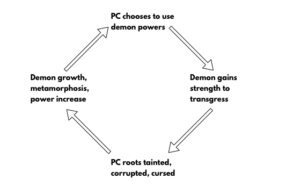 When the demon is stronger it can tempt the PC with more powerful effects, but its transgressions will be similarly worse. And there you have it. Demons could be a metaphor for pursuit of power, ambition or dedication to something at the expense of humanity and human relationships; or they could be really, really evil beings which latch onto humans and tempt them to use too much power and wreck their relationships and leave them as an emotionless, hollowed-out husk. Your choice. Demons have an associated drive. This is an expression of what sets the character apart from their peers. For example a character’s drive might be to be a great warrior or knight. That drive directs the demon’s power (in this case, in combat). In general Drives look a lot like careers or vocations; and in a lot of cases they function just like roots do as skills and experience. Thus if the character called themselves “Knight of Leopards” they might get an advantage when fighting, when conversing at court, when ordering commoners about, etc. Whether or not the world believes that demons exist, they definitely talk to their master. They tempt their master to use their power, and then introduce thoughts of how they might transgress. In-game you might want to give the job of roleplaying a character’s demon to the player on the left of the player in question. That player might have fun ideas on how the demon will next transgress if it gets enough wriggle room. Coming up: I’ll provide an example of generating the human characters in the Beyond the Waves archipelago setting. Shortly after, we’ll do an example of the demonic side of a character.